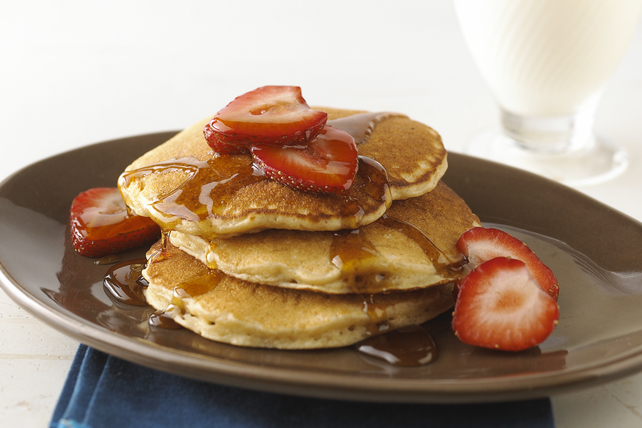 We've added creamy peanut butter to store-bought pancake mix to come up with this recipe for Pleasin' Peanut Pancakes. These pancakes make a family-pleasing breakfast or brunch (with a little bit of a flavour twist!). Beat first 5 ingredients with whisk just until blended. Heat griddle or large skillet sprayed with cooking spray on medium heat. Pour batter onto griddle, using 1/4 cup batter for each pancake; cook 2 to 3 min. or until bubbles form on tops and bottoms are golden brown. Turn to brown other sides. Serve topped with 1 cup sliced fresh strawberries. Before preparing the pancake batter, place baking sheet or ovenproof platter in 200ºF oven to warm. Cook pancakes as directed; place on warmed baking sheet. Cover, then return to oven to keep warm until all pancakes are cooked.